Initially developed in 1925 by the James O. Welch Co. and called the "Papa", the product was designed as a rich milk caramel on a stick for easy handling. 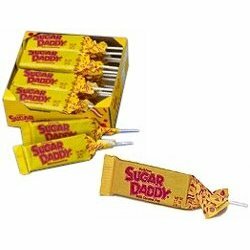 In 1932 the name was changed to Sugar Daddy to suggest a wealth of sweetness. It has since become a well-known product to consumers of all generations. To this day the Sugar Daddy pops continue to deliver long-lasting caramel enjoyment.